in my life that is truly pure . I know why I'm alive." " I feel like I've been doing this for many lifetimes. I know that I am at home"
Christine Hamer has been an instructor and professional performer of bellydance since 1990. 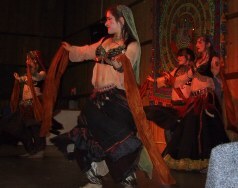 The roots of her ethnic dance experience began in 1988 with the study of Turkish and Egyptian sytle bellydance. 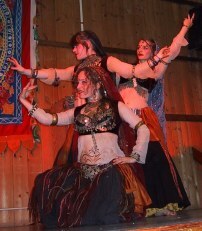 With that foundation, she combines North African, Central Asian, and Indian Gypsy dance to create a beautifully elaborate and unique dance form. Christine enjoys the opportunity to collaborate with artists from a wide range of backgrounds and disciplines. She has taught and performed with ensembles in India and across the United States. Maria Hamer is an experienced and professional belly dancer who has studied, taught, and performed since the spring of 1993. Her main focus is on Turkish and Egyptian belly dance disciplines, but she fuses and blends stylization and gestures of other eastern dance forms to create a very complex and vibrant performance. Not just a dynamic soloist, Maria is able to combine her unique style with dancers of similar backgrounds to form energetic and colorful troupes. Their performances are recognized for highly disciplined movement and impeccable synchronicity. This results in leaving their audiences spellbound and wanting more. 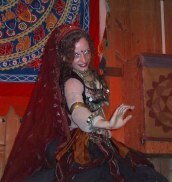 Maria has taught and performed throughout the United States and in Turkey. theater productions. Maria has also appeared in the video, TURKU: Live! I have always been known as a dancer -- even though any 'official' training did not begin until 1991. Dance is where the spirit shines through! "I feel the most whole when dancing -- all thought recedes and I am completely in the moment of the music (or is it inside of me?) Openness to melody, rhythm, and silence is a gift from the great one; and sharing the pure joy of dance is my way of sharing this gift." A student of anthropology at the University of Pittsburgh, Olivia was led to become involved in West African and Dunham Dance, which she studied for four years. 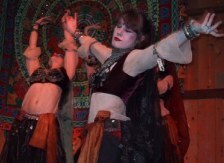 She's practiced Middle Eastern ethnic belly dance since the fall of 1996. "Eledi brought Middle Eastern Dance into my life. I have to admit, it was very difficult to settle into the refined, controlled, and simply elegant movements, but the energy generated when I dance with the woman in Zafira has caused me to learn quickly. I feel like I've been doing this for many lifetimes. When I here the laughter, the rustle and the music of the marketplace my heart starts racing and I know that I am at home -- at least until the sun sets, the lights go out, and everyone goes home. Then I dance alone." I started dancing six years ago, after seeing my beautiful friends perform this dance. An ancient cord was struck in my soul, and I knew I must dance. Christine Hamer, one of my great sisters, in dance and in my heart, was my first teacher. She taught me the importance of drilling the basics of Turkish style. I have travelled to Turkey and to various places around North America. While living in California, I studied with Jill Parker of Ultra Gypsy, I have also had the great pleasure of performing with her on various occassions, which was beautifully lovely and inspiring. I then moved back to Pittsburgh to dance with my friends, who I have danced with from the begining. With my sisters, it all makes the most sense, where dancing speaks all the language of all women of all time. My style is definitly a fusion, with a strong core in Turkish and Egyptian style, but with branches reaching to North Africa, Central Asia, India, Spain and beyond. There are many dancers who are very strong influences to me, although my Zafira sisters are the ones that entrance me the most, but I am also very moved by many others. I have a strong passion for the music and the beauty of this all encompassing dance form. In keeping in tune with my self, the music, and my fellow dancers, it all flows beautifully. As time has moved and shaped things, Zafira has been born, and we dance to the deep pulse of Earth. Dance like thunder! !